ACC Medlink is the leader in state to state medical transportation offering large, comfortable vehicles that are professionally staffed with our licensed medical crew to care for your loved one. Our medical vehicles are equipped with the latest in entertainment technology as well as three beds to accommodate family when loved ones are traveling together. Our expert interstate medical transport crew consists of a medical professional that has expertise in caring for patients with a wide variety of conditions, and professional drivers to get you and your loved ones to your destination safely. We offer medical ground transports that are a more affordable and comfortable alternative to air ambulance. We provide timely transportation with an emphasis on caring and personalized attention. Our transport teams are prepared to take care of the entire transportation process for you by providing you with the same level of care that we would provide to our own families. If you need to transport multiple patients, we can provide you with our new Med Sprinter Ambulance that can transport 1-3 patients at a time. Whether you or a loved one needs to travel to a medical appointment, your home, or another hospital in another state, we can help get you there. We are the non-emergency medical transportation service that can transport your loved one to any city or any state nationwide. Here’s how ACC Medlink outshines competing transportation services. 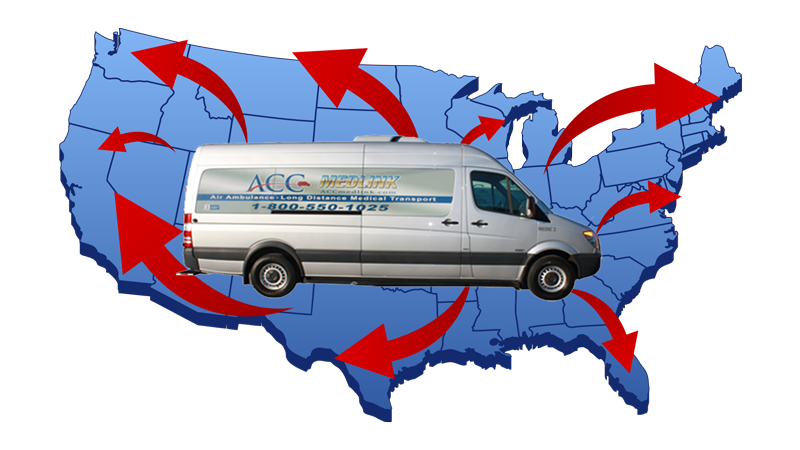 ACC Medlink is the premier nationwide medical transportation company. We offer state to state patient transport for non-emergency situations. Unlike the typical ambulance transportation service, ACC Medlink’s long-distance medical transport vehicles are specially configured for comfortable transport of patients who can not walk or sit up for extended periods. If your destination is more than 200 miles away then we are the safest and cost-effective choice available. If you need nationwide elderly transportation or state to state ambulance service, you can trust our qualified staff to handle the patient with the utmost in care. We offer an experienced team of drivers, nurses and patient care managers who work together to provide the most comfortable experience. We have an excellent track record for safely transporting our patients over long distances. On trips over 8 hours, we provide 2 drivers and a nurse to ensure absolute continuity of care throughout the transport. Our long distance medical vans are fully equipped to meet your needs and ensure the most comfortable ride. Whether you are restricted to your bed or you can sit up, our staff will make the necessary accommodations. We can even accommodate several of your family members or a pet so you can feel comfortable every step of the way. Our Mercedes Sprinter fleet are the only DOT approved vehicles in the entire industry for this type of transport. All it takes is one call and everything will be taken care of. Our transport coordinators are standing by 24/7 waiting to assist your with your long distance medical transport needs. You can rest assured that your loved one is receiving the top level of care. If you have any questions, give us a call at 1-800-550-1025.